A one-day Legal Services Camp was held on Sunday at Debargaon Higher Secondary School playground in Kokrajhar of Assam. The camp was organized by the Assam State Legal Services Authority in association with Kokrajhar District Legal Services Authority and under the sponsorship of Bodoland Territorial Council. The camp was attended by Arup Kumar Goswami, judge, Gauhati High Court as chief guest; Ashintamalla Bujar Baruah, judge, Gauhati High Court, Hagrama Mohilary, chief of BTC and Pramila Rani Brahma, Assam Minister for Social Welfare and Soil Conservation as guests of honour. The mega legal service camp organized by the Assam State Legal Services Authority in association with District Legal Services Authority, Kokrajhar was aimed to make the target groups aware of the benefits available under various schemes introduced by the government. The camp aimed to make people aware about their entitlements under various enactments and welfare schemes which are provided by various government departments. At the programme, as many as 17 government departments like Education, Agriculture, Food and Civil Supply and Consumer Affairs, Health and Family Welfare, Public Health Engineering, DRDA, Social Welfare, Labour, Diary Development, Industry and Commerce, Veterinary, Handloom and Textiles, Urban Development and Kokrajhar District Police presented their various welfare schemes and put up exhibition stalls for the public to visit and get their doubts clarified. The departments also distributed financial grants-in-aid and materials to the beneficiaries under their various ongoing schemes through the dignitaries. “All are equal before the law. Therefore, no individual or group of people should be privileged or discriminated by the Government,” stated Hagrama Mohilary while addressing the gathering. He said that each and every scheme adopted by the BTC was being implemented for the benefit of all the people of BTC. He asked the judiciary authority to organize such programmes at other three districts of BTC also to make all the people aware about law and their rights on the government programmes. Justice A K Goswami, executive chairman, Assam State Legal Services Authority, Justice A Bujorbarua, Judge Gauhati High Court, chief of BTC Hagrama Mohilary, Assam Social Welfare Minister Pramila Rani Brahma, BTC executive members – Rajib Kumar Brahma, Doneswar Goyary and other officials attend the legal service camp. Saythana Sharma, member secretary emphasized that the ultimate aim of these camps is not only to make people aware of their rights but also to empower them to exercise those rights and facilitate them in accessing those rights and benefits. 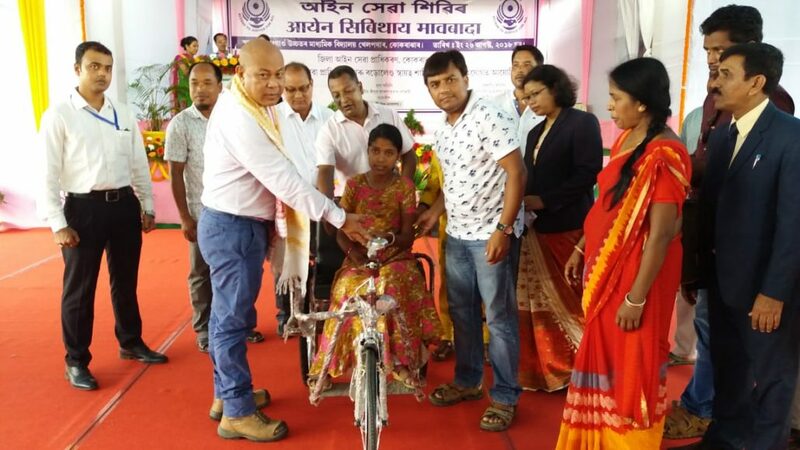 The other dignitaries who also attended in the event were BTC Deputy Chief Kampa Borgayari, MLA Thaneswar Basumatary, Executive Members Doneswar Goyary, Rajib Kr Brahma, Principal Secretary Biren Chandra Phukan, District Session Judges of Kokrajhar, Chirang, Bongaigaon and Dhubri.